This article is for anyone trying to get a date with a woman. As a woman myself, and working with 65% female clients of all ages, I have some insider information on what women want when it comes to dating… and what they don’t. I’m going to break it down in simple terms. Do any of these things, and your chances of getting a date dwindle. Avoid them, and you’re on the right path. Why, oh why, do men post these? I have a few hypotheses. It’s obvious that they think we, as women, want to see that they are in shape. Sure—we do. But we want to see you clothed. Period. If you’re in good shape, then we can tell… even if you’re wearing a sweater! (Sometimes, I honestly think men are posting these pictures for other men to see and be jealous. And sometimes I think they just want to show off.) 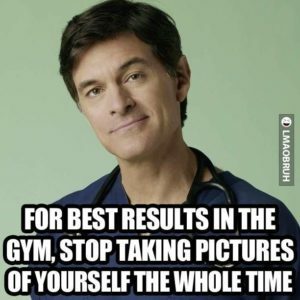 No women I know, friends or clients alike, will swipe right or contact someone because of a gym picture. If anything, they are liking you despite the picture. So, feel free to show women what you like to do—hiking, biking, surfing—but don’t take a gym selfie in the mirror (and claim it’s a hobby of yours). No one wants to see that… except you. So look in a mirror and admire yourself, but don’t subject the women you don’t know to it. Like the expression, “Laws are like sausages. It’s better not to see them being made,” the same can be said for muscles. Just show the finished product… out of the gym. If you don’t know a woman yet, don’t call her “babe,” “baby,” “boo,” “beautiful,” “cutie,” “hun,” “honey,” or anything that sounds remotely similar. These are terms of endearment that should be saved for when you’re in a relationship, and only if your partner likes them. Before you know someone, those terms come off as patronizing and condescending. You’re having a great conversation and you want to take it to the next level—a phone call or text exchange. (For the record, I don’t recommend doing this. Just arrange the date on the site/app. Things usually get lost in the shuffle once you move to text, and the date doesn’t happen.) You think, “I’ll just send her my number. No biggie.” She reads this as, “He’s lazy. Why can’t he reach out to me first?” or “Why can’t he be a gentleman and ask for my number? I don’t want to text him first!” Especially on Bumble, where the woman already has to make the first move, she doesn’t want to continue making all the first moves. My recommendation? Arrange the date online, and then a day before, write this: “Looking forward to seeing you tomorrow! In case you need to reach me, my number is 917-555-2928. What’s yours?” This is so much better than, “My number is 917-555-2928. Text me.” No thank you. Funny—I thought we all used Google. Apparently some people don’t! Women get very frustrated when someone says, “Why don’t you pick a place?” or “What did you have in mind?” There’s a lot of pressure there. Do you want to meet at a nice bar, a dive, a coffee shop, a restaurant, or something else? Especially if you’re going to pay (a whole other discussion), women don’t want to pick something above your price range. If you don’t know the area, the best, and only, thing you should do would be to Google the area and give her three choices. Then, you can add, “But if you have something else in mind, let me know.” Nine times out of 10, she’ll be so appreciative that you made the extra effort that even if your choices aren’t great, she’ll be very quick to overlook that because you tried. This goes for everyone. Don’t cancel at the last minute, don’t stand someone up (awful! ), and don’t otherwise be flaky in any way. I get it. People have done it to you. But, don’t perpetuate this non-committal culture. I got a text from Chris, the co-host of my podcast, So, We Met Online, saying, “I had three dates lined up this weekend. Three dates canceled on me this weekend.” Remember that there’s a person at the other end, not just a bot or an iPhone screen. An actual person who made actual time to see you. Stop doing these things, and your odds of getting dates will increase. That’s math. Use it to your advantage. Guys, wise up and listen to Erika. She’s giving us pre-feedback so that we can avoid bad behavior – and avoid clichés, like gym selfies. I didn’t know that it was a cliché. Thanks, Erika. Glad you enjoyed. If I’ve helped even one guy avoid a misstep, I consider the article to be a success. Bad girl-centered advice. You want to plan a date on the app for womens’ convenience. But women flake at much higher rates that men. These women don’t want to give the guy their number. Some women are paranoid and don’t want to give out their numbers. So men need to give a number, and hope the woman reciprocates. You expect men to plan and pay for a date, hope the woman shows up (and looks like her pictures), and rely on an anonymous app to communicate? No thanks. If a woman over 30 won’t give me her number, then she doesn’t deserve to be courted. This article was targeting female readers — that is true. I don’t, however, agree that women flake at a higher rate. Both genders complain to me about the same amount. If you know if a study showing this, I’m all ears! It sounds like you’ve had some less than pleasant dating experiences. Happy to talk through it if you like. Google “date flaked on me” gives mostly results about women. Your male cohost Chris got flaked three times in a row! In addition to outnumbering women on most dating sites, men initiate most messages, plan dates, and pay. You went on 90 coffee dates in a year, expecting men to pay and make it easy. With no investment, women lose nothing by flaking. Your female perspective might be valuable to men. But your advice caters to women. It does not address effective and efficient strategies for men. Why should a shrewd desirable man get in line to buy you a coffee and audition for a real date when you don’t have enough regard to give your number? A man with options should screen for a woman who is interested and DTF. This is not how it really works. Women swipe on too many Tinder profiles, then complain about excessive messages. So Bumble requires women to send the first message. But women generally don’t send a real message. They just send a “hi” or an emoticon. Or they self-congratulate on the fortitude it takes to send the first message. It is still up to the man to make all the real moves. You demand that men ask, men plan, men pay, day dates, coffee dates, convenient nearby dates, dates planned on the app, with no investment from yourself. You don’t even provide a phone number, facilitating flaking and ghosting. This will get you high-quantity, low-quality dates. I think you wrote about regular hook ups with a Baltimore paramour. Other men can sense that you aren’t especially available, and might exploit them while getting your sexual needs met elsewhere. Then you miss many high-quality men, and risk staying single long after age 30. For example, Jeremy refused to do a low-investment coffee date, and demanded an evening date with alcohol. Men with options like Jeremy have standards.